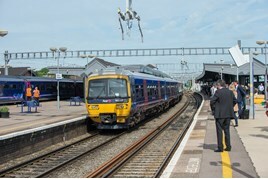 Trains similar to a Thames Valley Turbo could be fitted with sensitive door-edge technology, the Rail Accident Investigation Branch (RAIB) recommends following the conclusion of a review. It follows an accident on July 25, when a passenger was dragged along a platform at Hayes & Harlington. The 1137 Oxford to London Paddington had departed while the woman’s hand was trapped in a door. She had placed her hand between the doors as they were closing (RAIB said that this was in expectation that the door would re-open). The driver did not identify that she was trapped in the door, and she was dragged 19 metres, lost her footing and fell onto the platform. She suffered head, hand and back injuries. RAIB concluded that either the driver did not make a final check before departing, or that the check was insufficiently detailed. RAIB added that the driver may have been misled into thinking it was safe to depart because a door interlock light in his cab had illuminated, which indicated the doors were shut and locked. RAIB’s other recommendation was to extend (if necessary) its research into the passenger/train interface, to understand passenger behaviour and identify means for deterring passengers from obstructing train doors. For more on this, including RAIB's comments on DOO following this accident, read RAIL 805, published on July 20. So one person puts their hand in between closing doors (not many people daft enough to do that) and it's now possible that this will cost the rail industry millions to fit door edge technology. And the next time joe public injures him/herself doing something no normal person would do what then. The entire rule book dating back to the start of the railway is based on people doing stupid things. Not just joe public but peter pway (who should know better) as well.